The following factsheets are part of a series about national adaptation M&E systems. 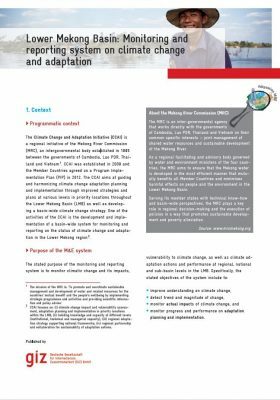 Each factsheet is describing the national adaptation M&E system in detail including the institutional arrangements, the M&E method and the data and indicators used. The intention is to make national adaptation M&E systems more tangible and illustrate how they can be designed. The series was initially published as part of the 2014 study “Monitoring and Evaluating Adaptation at Aggregated Levels: A comparative analysis of ten systems”. In 2017 many factsheets were updated to document the pgrogress made.